Chemical-free healthy living. Removes over 99% of bacteria. Removes thick grease, dirt & bacteria from all hard surfaces. Perfect cleaning with just water. Good Housekeeping Institute approved 2018. Allergy friendly product.High performance cloth which removes thick grease, dirt and bacteria from all hard surfaces, using just water. Special features: Cleans with just water - save time No chemical needed - save money Extra thick - for deep cleaning Brilliant on: Worktops, stainless steel and glass 3 Year Guarantee: This e-cloth is machine washable 300 times, up to 90°C. With weekly washing it is guaranteed to last for 3 years. 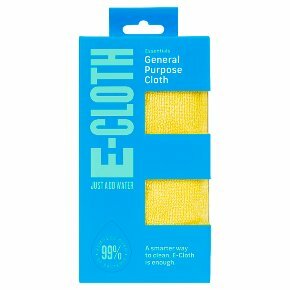 E-cloth & your health Using e-cloths with just water reduces the need for chemicals, which can have harmful effects, especially on mothers and babies and those who suffer from allergies, asthma and chemical sensitivities. How e-cloths work e-cloths have 480,00 fibres per cm2. By combining e-cloth's unique fibre technology with water they break up and hold grease, dirt and bacteria, which normal cloths leave behind.